Pianist-Surrey, Sussex, Kent, Essex, Hampshire, Hertfordshire, Berkshire etc. 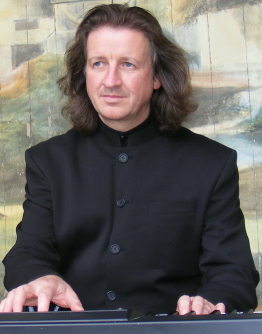 London was the starting point for Eugene’s career as a solo pianist. as his career progressed his work started to spread further afield to Surrey, Sussex, Kent, Essex, Hampshire, Hertfordshire and Berkshire. From an early age Eugene has always showed a keen interest if there was a pianist playing anywhere. He would, if possible, go over to them a stare at their fingers as they moved effortlessly of over the keyboard. He started taking formal lessons when he was eight and he learned music by all the great classical masters before gravitating towards jazz and improvisation. Eugene’s main interests lie within jazz, swing and blues. The word ‘jazz’ often put’s people off, but you will find that his jazz piano style is easy on the ear. His main influences are keyboard giants such as Oscar Peterson, George Shearing, Erroll Garner and Dudley Moore. Over the years there have been many other musical influences such as Ben Webster, Stan Getz, Ella Fitzgerald and Jimmy Smith. As a classical pianist he has a wide repertoire covering many of the great masters. This enables him to play anything from just a few short pieces for a wedding ceremony to a full evening of Debussy, Bach, Albeniz, Chopin and Schubert. Being a professional Eugene puts a great deal of time and effort in practicing his craft every day. For weddings it is important to be able to play many different styles including rock, ragtime, latin, classical and even sing-a-long. Please ask if you have a favourite piece that you would like to be played during your wedding ceremony. If you are thinking of organising a Cockney evening, all you have to do is provide some good hearty voices. Please see sing-along page for more details. Eugene has an incredible amount of talent as a soloist and seems to make the art of playing solo jazz appear easy. There are hundreds of keyboard players around who can play in a band, but playing solo is a completely different story. His classical training and influences has ensured that his music is full of surprises. As well as performing solo he is also comfortable performing with any musical combination including trios and quartets. More recently he has been appearing at many events and parties as a duo with a double bass. A piano and bass combination is great for any event. It can either produce subtle background music or it can really really swing. It is the perfect duo. 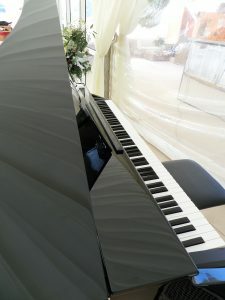 Prices are from £250 for a solo pianist in the Surrey, Sussex, Kent, Essex, Hampshire, Hertfordshire and Berkshire areas. Please feel free to contact him for a quote for other areas. 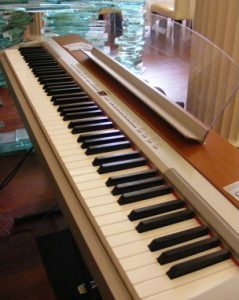 Eugene can bring along his Yamaha P-155 digital piano if there is no suitable instrument available at the venue. The Yamaha P-155 has exceptional sound quality and portability. The instrument can easily be moved around the venue and can even be set up outside. Please note that there is no additional cost for the use of this piano. If you are looking for a grand piano look then a baby grand shell is available. This looks more like a real instrument and less like a keyboard. This makes it ideal for special occasions where a normal digital instrument may look out of place. It only costs an additional £80 on top of the normal playing fee to hire the shell. That is a small fraction of what it would be to hire a a proper instrument from a supplier. Booking is quite easy- all you have to do is fill in the QUOTE FORM. When filling in the form please make sure let me know where the event is going to take place. If you haven’t actually booked a venue then an area such as Surrey, New Forest or Essex. The form will also ask you for a line-up. Please state whether you would like solo piano, duo, five piece band etc. If you hire the jazz band, it will not be a typical function band. There are plenty of great function around to fulfil your requirements. Please fill in the form HERE to get a quote for your event. The “Frequently Asked Questions” page has answers to many queries. West Country, South East England, Isle of Wight, Rutland, Huntingdonshire, Worcestershire, Herefordshire , Lancashire, Yorkshire, Northumberland, Cumbria, Merseyside , Middlesex, South Yorkshire, Tyne and Wear, West Yorkshire, Manchester, Wales, East Anglia and Durham.